The Carbolic Smoke Ball Company advertised in the Pall Mall Gazette in 1891 that their Carbolic Smoke Ball was a cure for flu, bronchitis, coughs, colds, headaches, hay-fever, whooping cough, laryngitis and sore throats amongst others. It was so confident of the usefulness of the carbolic smoke ball, and its ability not only to cure but also to prevent someone from getting the ‘flu, that it advertised on the following basis: Anyone who used the carbolic smoke ball in a particular way for a specified period of time, but who still caught influenza afterwards, would be entitled to claim £100 from the company. The advertisement went on to say that the company had gone so far as to deposit £1000 in the Alliance Bank in the event of any such claims. The plaintiff (who nowadays would be called the ‘claimant’) saw the advertisement and decided to buy one of the carbolic smoke balls. She used it exactly as advised, but still caught influenza. She took the Carbolic Smoke Ball Company to court in order to claim her £100. The court found in her favour, but the defendants appealed. On appeal, the defendant’s case was that there was no binding contract between the parties. The defendant company had no means of checking the ball, or of establishing whether the plaintiff had in fact used the ball as directed. They also said that the plaintiff had not provided any consideration, and that merely doing an act in private (i.e. following instructions) would not be enough. They argued, in the alternative, that if the court found there to be a contract, that contract was no more than a ‘wagering contract’ in which liability was purely determined on one issue – whether the plaintiff caught influenza or not - in which case it would be void, or that if it was an insurance policy that it was ‘bad’ because it relied on whether or not there would be an occurrence of an uncertain event. However, the court did not consider that the ‘wager’ or ‘insurance’ arguments were valid. The plaintiff argued that the advertisement constituted an offer, which could be accepted by anyone who saw it. The court agreed with the plaintiff and dismissed the defendant’s appeal. 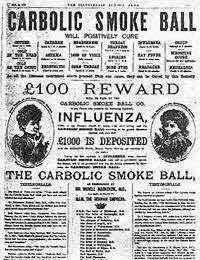 The advertisement was a promise to pay any person who took up the offer the sum of £100 if they caught the influenza despite having used the smoke ball as directed. The plaintiff provided the consideration required to form part of the contract in their continued use of the carbolic smoke ball. The effects of this judgment are still felt today. If you lose a family pet and put up a poster offering a reward for its safe return, you are providing an ‘offer’ which someone may accept, if they find your pet safe and well. Similarly, the police offer rewards to ‘anyone’ who can provide information leading to the arrest and/or conviction of a suspect in a criminal investigation. If a member of the public provides that information, and the police are as a result able to arrest/secure a conviction against the wanted person, the reward money will become payable.